Yechiya Ya’akov Dahari’s whole family diligently kept the Torah in Yemen even under the most trying of circumstances. As a metal worker who raised nine children through poverty and prejudice, he felt he was tough enough to handle life in Yemen. But as time went on, the situation became increasingly dangerous. When kidnappings and attacks became a daily worry, more and more of those close to him made aliyah with help from The Jewish Agency for Israel. A proud partner of Federation, The Jewish Agency has been at the forefront of helping Yemen’s historic but beleaguered Jewish community find a safe haven in Israel since Operation Magic Carpet brought over 49,000 Yemenite Jews to Israel in 1949, just after the state’s founding. This community has gone on to play a fundamental role in shaping the Jewish State, holding prominent roles in Israel’s political, cultural, culinary and religious life. 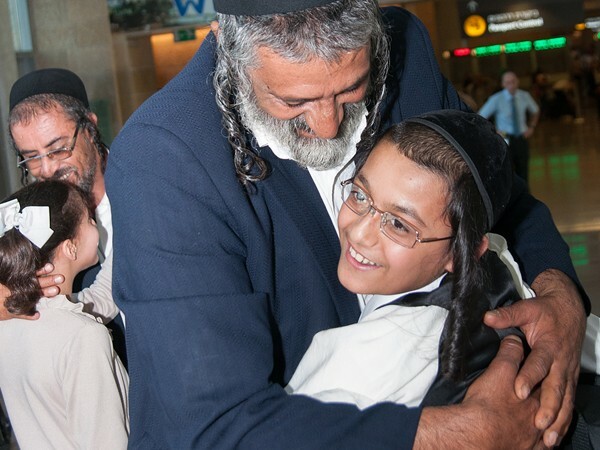 Subsequent operations brought thousands more Yemenite Jews to Israel, cumulating in the early 2016 mission that brought nineteen of the last remaining Jews out of the conflict-ravaged country to safety in Israel, including Yechiya Ya’akov and the rest of his family—and their unique Torah. Upon arrival in Israel, Yechiya Ya’akov cried tears of joy upon first seeing Zion, the land, then cried more upon seeing another Zion, his grandson. After only four years in Israel, the young man already sounds and dresses like an Israeli teen and looks forward to helping his family adjust to life in Israel. But the family isn’t worried about losing their unique heritage. Yechyia Ya’akov’s son, Rabbi Shlomo Yechiya, smuggled their community’s centuries-old Torah scroll on his voyage to Israel. Though the scroll was threatened daily in Yemen, he is confident both it and the community that has kept it through untold hardship are now home safe in Israel. “We dream that we will make it, and we can build our lives so that everything is behind us. All we want is to keep our Torah and to live in a dignified manner,” he says. Photo credit: Moshik Brin for The Jewish Agency for Israel.